↑ Germplasm Resources Information Network (GRIN) (2007-05-12). "Family: Annonaceae Juss., nom. cons". Taxonomy for Plants. USDA, ARS, National Genetic Resources Program, National Germplasm Resources Laboratory, Beltsville, Maryland. สืบค้นเมื่อ 2008-04-18. ↑ "Annonaceae". ระบบข้อมูลการจำแนกพันธุ์แบบบูรณาการ. สืบค้นเมื่อ 18 March 2008. ↑ 3.0 3.1 Flora of North America. "2. Annonaceae Jussieu". 3. Archived from the original on 21 April 2008. สืบค้นเมื่อ 2008-04-20. ↑ Bridg, Hannia (2001-05-03). "Micropropagation and Determination of the in vitro Stability of Annona cherimola Mill. 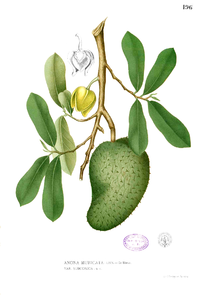 and Annona muricata L." Zertifizierter Dokumentenserver der Humboldt-Universität zu Berlin. Archived from the original on 24 April 2008. สืบค้นเมื่อ 2008-04-20. "Annonaceae". ระบบข้อมูลการจำแนกพันธุ์แบบบูรณาการ. สืบค้นเมื่อ 18 March 2008. หน้านี้แก้ไขล่าสุดเมื่อวันที่ 10 กันยายน 2561 เวลา 09:36 น.